I have been looking at the apostrophe on both of the Fish’s Infallible Hair Restorative bottles for a long time. The darn thing is shaped like a 7 and for the life of me I can’t figure out why someone would shape an apostrophe like that unless it was some sort of signature item the mold maker used. The more I looked into this apostrophe thing the more intrigued I became. Not just the Fish’s bottle has the 7 looking apostrophe several other known “eastern" bottles display that crazy looking thing-a-ma-jig. Take a look at the apostrophe on the blue Fish’s bottle. It really looks like a seven (7). Not like your normal looking apostrophe. Here’s the apostrophe on the aqua B.F. Fish’s bottle. The lower leg may be shorter but it looks to be really close to the blue Fish's apostrophe. 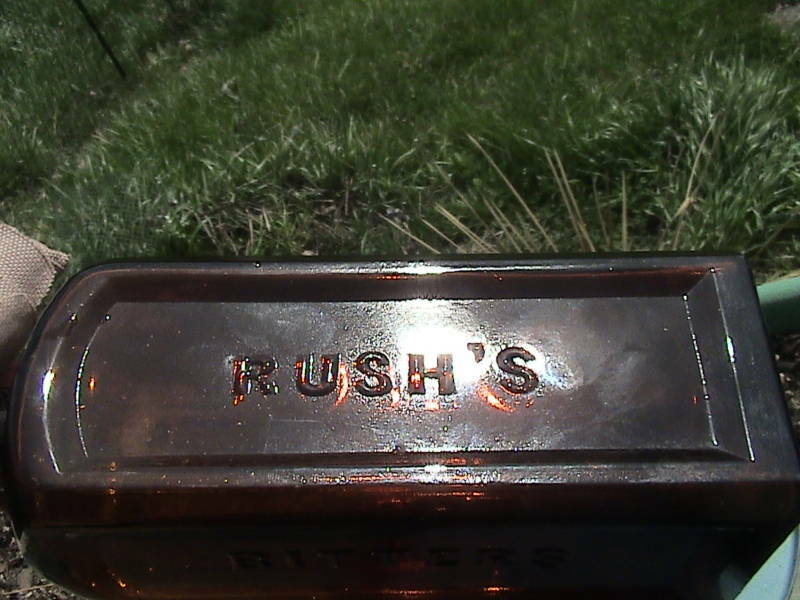 How about this one on the Rush’s Bitters bottle, looks real close to a 7. Could it have been made by the same character. er... mold maker? If you go look at your Ghiradelli soda you will see a 7 looking apostrophe. Did you say your Ghiradelli was a little shorter and thinner than your normal western soda? You did didn't you. And how about this Risley’s apostrophe, upside down and backwards. Could it have been made by the same mold maker, maybe on a Monday after a rough weekend? Do you still think that your Fish's Infallible is western? I don't believe the Fish's bottles moulds are western in origin. It's possible that the blue bottle may have been blown at Pacific Glass Works, there's just no evidence to absolutely say for sure that it was not. However there is absolute proof that the rectangular Fish's bottle was blown back East prior to PGW's start-up. That bottle and the blue bottle were made by a pattern /mould maker in the East. Several other eastern meds exhibit the same characteristic letter style, including periods, font style, etc. W.F. Ok Rick, I will bite. My super x-ray vision (from one eye only) sees differences in the "7" and the apostrophe on the other bottles. I guess one could say the "h" looks similar also? I believe that some "U"s look the same on some bottles blown in the East. My humble opinion..."7" or goofy slightly curved leg apostrophe...upside down or not, the blue Fish's and most if not all of the aqua, and flint med style Fish's are Western made by people who walked, or sailed from the East.So to answer your last question..."yes". Put that good eye on the S in the aqua Fish's and the Risley's. They are upside down and identical. Are they not? Hmmmm...I just looked at one of my Hostetter's and the "s" looks the same as my Castle Bourbon flask. I think that flask was made in Pittsburgh. I KNEW I should not have bit...I KNEW it! By the time the blue Fish's were being made there were two glasshouses in SF. Why outsource ? Also, isn't it likely that most of the mould makers (especially during the incipient years of the glasshouses) were of eastern origin and would have brought their 'style' with them to SF ? I have seen the med style Fish's that appeared Eastern blown similar to the line of Dr Vincents medicines. However there are examples of this style that I am 99.9% certain were blown in S.F. The single roll deep greenish "Western Aqua" version is a S.F. bottle. The blue version may have moulds shipped in from Croatia, or Tibet, but I will go to my grave believing it was blown in S.F. Of course, short of Carlton Newman holding one in a photo while taking a shower (Its really shampoo), we might never know. There was only 1 glassworks in San Francisco at the time the blue Fish's bottle was actually made. SFGW had not begun yet. At the time the Fish's blue bottle was made, the mould makers in Pennsylvania had almost 80% of the market for bottles in the US. Redington & Co. was responsible for marketing the Fish's blue bottle, this occured in November 1864. SFGW was not in operation and did not produce colored glass until late 1866. John H. Redington had sold his drug store trade in 1861 and began a wholesale and importing business. This included the Fish's Hair Restorative bottle which Niles Mill's sold the right to manufacture and sell in California and elsewhere to Charles R. Story who had owned a drug store business and sold out to go into co-partnership with John H. Redington. Together the business became Story, Redington & Co. Both Fish bottles utilize the unique stylized apostrophe (which is also seen on several eastern blown/distributed bottles) that is not seen on any western made mould or blown bottle that I'm aware of. I will quote from the source, "Red, White and Blue-Style Changed and price reduced-In order to protect consumers against counterfeits and imitations, the GENUINE FISH'S INFALLIBLE HAIR RESTORATIVE wilhereafter be put up in ROUND BLUE PINT BOTTLES with the words "FISH'S INFALLIBLE HAIR RESTORATIVE" blown in the glass on the side, and "N. MILLS" (the original proprietor) on the shoulder of the bottle. The same has a Red, White and Blue label. This advertisement was placed on November 24th, 1864 in a large California newspaper. I believe this provides the proof. The one that came out of Sierra County a few years ago was in a late 1880's hole. I have always said you can't positively date a bottle by where it was dug. OK... there are exceptions like the Nevada towns that only lasted a couple of years or pits that were only used for a known period of time. Throwbacks happen a lot, but there seems to be a pattern with this particular bottle coming out of late 60's holes ! Anyone have details on other dug Fish's and the layers that produced them ? I know of a number of early hair bottles found in later holes. Henley's Indian Queens (4) have been dug in Oregon over the last 40 years. Each is a late 60s EARLY 70s bottle. The holes were Bromo and Maltine age. I know that "hair Restorative" bottles usually contained a shampoo type product. Possibly they were slow sellers, and sat in stock for awhile, or the containers were kept in the home, and re used over and over until they broke. It would explain how Western Hair bottles are for the most part all rare. Henley's, Fish's, Grimm, etc. You would think everyone used shampoo, but the bottles are tough to find. I believe the blue Fish's were made from 1864-1868. It would not be unusual to find one in a bit later layer. What would be freaky is to find one in a 1850s hole. Now THAT would be wierd! A time traveler.